The core value of good leadership is character. Ability matters. Decision-making is vital. The skills to communicate and inspire are essential. But character trumps them all. Few things did they get more right than the idea that character counts. While issues are important, my mentors preached the soul of a man or woman was of far greater importance than any individual debate. Two people can get a lot of work done even if they disagree on key issues, but only if trust is present. Trust is a byproduct of good character. Issues are debatable, character is not. Everyone is imperfect. The importance of character does not mean we expect our leaders to be different. Character is not perfection. Our leaders can’t be perfect. They will make bad choices, sometimes disastrous choices. Some of those choices can disqualify them from leadership, but rarely. More often than not, if a leader properly handles a bad decision–admits it, seeks forgiveness, makes amends–the mistake can actually propel them to better leadership. However, we can’t fall for the false teaching that because every person is imperfect, bad choices can be ignored. Some are quick to excuse themselves or their leaders whenever they make mistakes by quickly comparing them to the mistakes of others. It’s a false comparison. Not every mistake is equal. Some things do have more penal consequences than others. A pastor who has a series of affairs can be forgiven, but he should not continue to direct a church. A teacher who says inappropriate things to a student can move on, but should never be trusted around children. A leader who refuses to acknowledge his immorality can do significant things, but they should not be allowed to lead. Sadly, many of the leaders of the Religious Right have given up on the idea of character. Some never believed in it–the message was spoken to manipulate the vote and take in money. Others believed the message, but have been disappointed by leaders they thought had a strong moral fiber. Having experienced the disappointment, they are now willing to sacrifice character for the mirage of power. Power has always been the great threat to character. It lures leaders and followers alike, telling us we can make excuses for thoughts and behaviors because the end is more important than the means. It causes us to justify inappropriate actions of those we like because we fear what happens if our guy loses or the other party takes control. Power lures us in relationships, politics, management, and every human endeavor. It was the seduction of power which lured Adam and Eve from obedience. It was the arrogance of power which swayed David that he deserved Bathsheba. It was the fear of losing power which convinced Ananias and Sapphria that they could lie about how much money they gave. The seduction of power causes us to do foolish things, follow the wrong people, hurt those we lead, and sacrifice everything we know to be right just in hopes of having control. Power is so (sorry for this) powerful that it cannot be handled lightly. Anyone who thinks they deserve power, shouldn’t be given it. Anyone arrogant enough to believe they can handle it without any negative effects, shouldn’t be trusted. Only those who have keen awareness of the dangers of power and a humility which forces them to surround themselves with checkpoints can be trusted with the reigns of power. Power has proven itself so dangerous in this history of humanity that it demands character from those who have it. When we dance with giving the immoral person the most power, we are dancing toward our own death. To say character no longer matters is to sacrifice everything I know to be true. I was raised by a loving, conservative, Christian community. They loved me, encouraged me, and showered their support on me. I can’t imagine life without them. One of the greatest lessons they taught me was that character matters. They were right. What I can’t understand is how so many who believe that character matters have boldly embraced a candidate for whom character is never part of the discussion. Many who thought Bill Clinton was the anti-Christ now campaign for a man who would make Bill Clinton blush. It would be one thing if they did this after every other candidate was defeated, but many did so while there was ample opportunity to enlist a candidate with solid moral character. Possibly for the first time in my adult life, I can understand (and have compassion) no matter how a person says they will vote in this election cycle. Some will say I can’t vote for him, so they will vote for her. Some will say they can’t vote for her, so they will vote for him. As for me, I can’t vote for either one. I want to vote. And I will vote. But I cannot vote for either of the two main candidates. I can’t, because while the Religious Right got many things wrong, they got one thing right–character matters. It did then. It does now. I still believe character matters. I couldn’t agree more that character matters. My only concern is that, although you didn’t say you support Hillary, you certainly made it clear that you eschew Trump. When speaking of character, I am concerned about both candidates. Hillary has proven over the past many decades that she is corrupt and recently criminal. I know Trump is no saint however, compared to Hillary, he looks like Mother Teresa. I presume you have an upcoming blog post addressing Hillary’s lack of character? Jerry, on my Facebook intro I made it more clear I can’t vote for either. I’m blessed/cursed to live in California, which means that I can vote for anyone and Hillary will still win the state. I don’t know what I’d do living in a battleground state like Ohio or Florida. 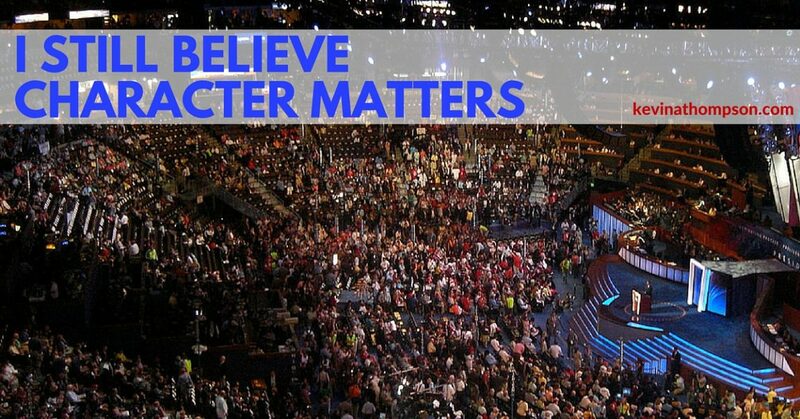 Character does matter, but elections have consequences. Jerry, in my post I said I can’t vote for either of them. I guess I thought the Hillary issues were more obvious with what the FBI said. I don’t have nearly as many in my audience voting for her so I focused more on him. So many positive teachings from the scriptures stream into my thoughts as I view your post this morning. Why participate in evil speaking, gossip and innuendo? Why post disparaging remarks with an unflattering caricature? When did the “Golden Rule” turn into the “Golden Whip”? Sean, why should a pastor talk about the importance of character? That’s my job. Could you please give a few proven facts as to why Trump`s character would cause Bill Clinton to blush? You may need to research Bill Clinton? I’m in Arkansas; I’ll bet I’ve heard far more than Google. Can anyone reach the evangelical leaders who (supposedly) are said to be mentoring Trump??? this is not gossip incidentally…this is about choosing leaders. From what I read about Trump’s reaction to Cruz after the Rep. convention…doesn’t sound like Trump gets the concept of…building bridges. Nor of what a real apology is. Why isn’t Dr. Dobson, other religious leaders…mentoring Trump to learn how to build/restore professional relationships????? Are they changing Trump…or is he changing them????? Kevin, I normally am very positive towards your posts. But I have a couple of concerns with this one. First of all, do you realize how many people in your congregation will follow your lead on this just because you said so? It happens. If you deny it, you are not living in reality. Secondly, this election, just like every other election, is about more than just a single person sitting in the Oval Office. It’s about the staff and leaders they bring along with them. And those leaders will make a lot more decisions that will effect the moral compass of this country more than just the one person. There have been many elections in our history where the character of those elected did not match up with what Christian voters may have liked, but responsible citizens still vote. Now if you personally don’t think you can vote, then don’t. But to lead others to do the same because there is not a candidate with enough moral backbone to make me feel good about my vote is poor leadership in my opinion. As Christians we are not citizens of this world… but at least we get the privilege to vote here. Brandon, I never said I wouldn’t vote. I said I couldn’t vote for the main two candidates. Not voting for Trump is a vote for Clinton and her choices of Supreme Court Justices, etc. Lord, help us!!! It’s fine to think that way but I just do not think that is true. For me to vote for whomever I want is not a vote for your candidates main opponent. You are right on, Pam! Be careful, being honest and objective can get you in trouble. My first election I voted for Jimmy Carter. Great Christian man, awful president. I am a local pastor and I respect every persons right to form their conclusions on who to vote for in November. I like to think of elections like sporting events. Let’s take a basketball game for example. If in the course of the game the officials miss an obvious call and it gives the opposition an advantage, I have a choice to make. I can argue, protest and make sure the official knows he missed the call and that all of the spectators know it as well. Or I can keep the ultimate goal in mind, winning the game, and react in a manner that gives my team the greatest chance to win. The latter, though it is not as much fun in the moment, is the best choice. My good friend, Kevin A Thompson, in this blog post has chosen to take his stand on an issue that, if many people follow his lead, will cause the game to be lost for his team. I can hear Kevin now saying, “What team? I’m not a Republican.”. To that I say, that isn’t the team I’m talking about. I’m talking about followers of Jesus. Our team is for issues of morality that are in legitimate danger in this election. Here is an article that describes why I disagree with KT’s conclusion. I don’t think my vote is for a person in this election but rather for the greatest chance of influencing my government to legislate in favor of issues I believe are in line with Biblical principles and near to the heart of God. Please hear me in that I don’t think Republicans get it right on all issues and that Democrats don’t always get it wrong. We can all learn from each other. So don’t throw away the game to win an argument with the ref by voting for someone else that cannot win. Elections aren’t so you can say to your buddies later, “I got it right by not voting for either.” As people who love people and love God we have an obligation to weigh the consequences of the candidates being elected in terms of moral impact. For me it is a simple decision because I believe life begins at conception and that any candidate who is in favor of the murder of those tiny people will not get my vote. In Trump’s case, yes he has been for and against abortion, but he says he will govern pro life. I know the other candidates will be pro abortion. So with Trump I at least have a chance and he showed a list of constitutional Supreme Court Justices that he plans to use for appointments. What is your moral criteria for a candidate to get your vote? I have no problem with your perspective. I’m disappointed in Grudem’s tone in his article–unless I misreading it, he is making it sound sinful to vote differently than him. I wish he would have just said, “Here is how I’m voting and I don’t think it’s immoral to do so.” I have a deep problem with him assuming the only moral vote is for his candidate. I still don’t believe the idea of voting for a candidate is a way of not playing the game. Candidates run. We vote. Each state sends delegates and the Electoral College convenes. The outcome is not my responsibility. I’m only in charge of my vote, the outcome belongs to God. I’m with KT on this… I can’t look my teenage kids in the eyes and honestly say I voted for either one of the main candidates… there is no justification, no elevator speech, no simple explanation that I could provide (and I’ve searched earnestly) my children to what brought me to that decision. My hope is that there will be a Christ-focused, loving, and meaningful discussion among Christians about their role(s) in American politics post-election.